I have a bit of a history with the space where Breakfast Republic resides in Encinitas. It was the relatively longstanding home of Firefly Grill & Wine Bar, which could always be counted on for a worthy weekend tasting menu paired with wine and their regular winemaker dinners. Toward the end of Firefly’s run, I always wondered why they did not give the place a makeover as it had so much potential. Breakfast Republic saw that potential and they have completely transformed it and the results are quite nice. Before I get into what’s going on at this new hotspot, I should preface it by saying it takes a really fresh, innovative breakfast concept to impress me for this meal. I’ve been known to whip up some crowd-pleasing breakfasts that include unique scrambles, quiche, frittata’s breakfast burritos and breakfast sandwiches. My point is that going out to breakfast, for the most part, is a social occasion or the rare occasion where daytime drinking happens in the form of brunch mimosas or Bloody Mary’s. Locally, the only places that have impressed me with their offerings are Beach Grass Café in Solana Beach and the quiche from Pannikin. The occasional gut bomb breakfast burrito from a number of Mexican joints also happens on a morning after a night out. That said, news of this innovative breakfast concept coming to Encinitas piqued my interest. 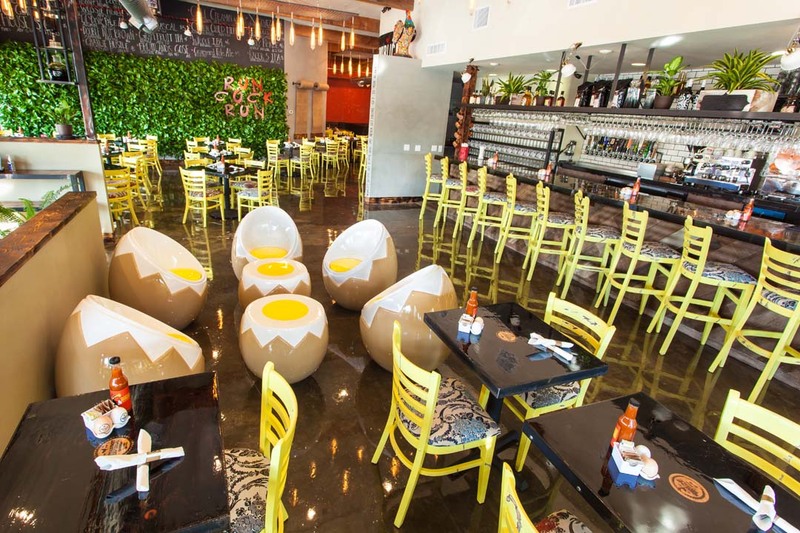 With locations in North Park, Liberty Station, East Village, Ocean Beach and Encinitas, Breakfast Republic is on a roll with their expansion throughout San Diego County. They serve up tasty takes on American classics such as Oreo Pancakes, Shrimp & Grits and S’mores French Toast as part of their innovative breakfast menu that locals and visitors will flock to when they’re in search of a fun and unpretentious place to begin the day. Another unique element of Breakfast Republic is the rotating list of 20 beers on tap, which are available as samplers to complement many of the unique dishes they serve. On that note, they also have a full bar and I really should revisit this place on a weekend when some daytime cocktails are in order as they have a very creative list going. Besides a fun mix of mimosas, they offer super fun sounding cocktails like the Summer Breeze that has Purity Vodka, a Tropical Detox antioxidant shot, muddled blueberries and raspberries, lemon squeeze, a splash of soda, water and orgeat. Hey, if daytime drinking is in order, might as well keep it healthy right? I should mention that cocktail runs $13 so I’m hoping it’s substantial. The creative mix of cocktails run from $6 to $13, so they are not all that pricy but they all sound delicious. Alright now, let’s get into the main attraction here, the breakfast options. I should preface this with besides the innovative twists on classics, it is possible to get your basic eggs, bacon, potatoes and toast. They divide the menu up into Playing Fare, Benedicts, Omelets, Scrambles and Pancakes. Playing Fare offers up about 15 options ranging from Turkey Meatloaf Hash to Shrimp & Grits to Breakfast Jambalaya to Steak & Eggs to Breakfast Hot Dogs to a Vegan Madras Curry Scramble. Side note, I’m wondering if the pot-smoking crowd has gotten wind of this place. Some of these dishes sound perfect to quell a case of the munchies. I was a bit boring in my selection here, going with the California Breakfast Burrito with skirt steak, eggs, pico de gallo, infused guacamole, potatoes, bacon, cheddar and sour cream served with black beans Mexican rice and salsa. It was a very good meal for $12. The Benedicts section offers a fun twist on several classics with my favorite being the Croque Monsieur with ham, gruyere cheese and béchamel sauce. Omelets come in five varieties including an Asiago-Fennel Sausage, Shrimp and Ricotta Frittata; Hickory Smoked Sausage Omelet; and a very interesting looking Mashed Potato Omelet with bacon and cheddar cheese topped with sour cream. My son Quinn had the Portuguese Linguisa Sausage scramble with bacon, hot sauce, green peppers, garlic, tomatoes, thyme and oregano. It was a good scramble, but with all the other creative options I was feeling that we ordered a bit conservatively. Pancakes are where Breakfast Republic lets its freak flag fly. Not really, but there are some very creative options from traditional Buttermilk, to Oreo Cookie, Churro, Cinnamon Roll, Strawberry Cheesecake, Pineapple Upside Down and a mix and match option. French Toast is the same kind of crazy good with Lemon ‘n Coconut, Banana Split, S’mores, Mascarpone and Strawberry, a Mr. Presley which is a fun take on Elvis and his peanut butter thing as they stuff the French toast with it topped with banana fosters and bacon. And of course they have a gluten-free option with the Cinnamon Raisin and a Brioche. Pancakes and French Toast run from $7-$13. I should note that all the OJ is fresh squeezed and there is a nice selection of kombucha and cold brew to enjoy on premise or to fill your growler to go. Lots of interesting coffee and tea options as well including a Café de Olla, the Mexican staple that is the house blend infused with cinnamon and piloncillo. My visit was on a Wednesday morning at 10 a.m. and it was bustling. Word is that weekends are very busy so take that into consideration. My only request is that they add some quiche options to the menu, there is definitely room for some creativity with that dish. Breakfast Republic is located at 251 N. El Camino Real in Encinitas. They are open seven days a week from 7 a.m. to 3 p.m. Call (760) 452-2121 or visit breakfastrepublic.com.